Growing up in Hoboken, New Jersey there wasn’t much of an opportunity to go outside and play when I was very young. We lived in an apartment building that didn’t have a backyard, there weren’t any parks around, so I entertained myself by reading. I read everything I could find. My favorites when I was very young were Ramona the Pest and Where the Wild Things Are. Then I graduated to the Hardy Boy and Nancy Drew mysteries, anything by Lois Duncan, and I was fascinated by Edith Hamilton’s Mythology. My taste was truly eclectic. As I got older I naturally spent a lot more time in front of the TV than I probably should have, but like reading, it ignited my imagination. I watched everything from cartoons to sitcoms to westerns, but it wasn’t until I started watching soap operas that my habit turned into a hobby. I loved reading fiction, I loved watching soaps, so something about the combination of those two things clicked and I was inspired to write my own stories. The first thing I wrote was the bible for my own soap, which had the rather uninspired title of SECRETS. A soap bible is the detailed outline for all the plots that would air over the course of the first year so, technically, SECRETS was my first novel! Diversity is key to a writer’s success so I write in several genres. Currently, I’m writing a cozy mystery series, but I’ve also written two young adult supernatural trilogies as well as some adult fiction. I really enjoy being able to jump from one genre to another as I believe it strengthens my overall writing skills and gives me the courage and freedom to push genre-boundaries. Each genre I write in highlights a different facet of my personality and my writing abilities. I was drawn to the supernatural genre because I’m a huge fan of that material ever since I was a kid. Dark Shadows, V, Night Stalker, Buffy the Vampire Slayer and the novels of Anne Rice and Stephen King are all favorites of mine so I absolutely wanted to contribute to the genre. As a writer, it’s fun to bend reality and I welcome the fact that there are no rules when writing a supernatural novel other than staying within the confines of the specific rules that you create for your world. I also enjoy tapping into my younger self in order to write for the YA audience, which keeps me connected to younger readers and forces me to think – and write – outside of my safety zone. The cozy mystery genre is new to me, but it’s quickly become a favorite. I find it both exhilarating and challenging to have to create an ordinary world wherein there are extraordinary circumstances in each book. My series takes place in an idyllic lakeside community with regular, everyday people and it just happens to be a hotbed for homicidal activity! I’ve become a better writer not only because I’ve been pushed to devise interesting murder mysteries that aren’t so easy to solve, but also because I’ve had to do it within the confines of realism. What excites me is that the cozy mystery genre, to me, is very much like the soap opera world. The same core characters are in each book so I get to explore them, their relationships, and their histories more deeply and with much more insight and scrutiny than I’d be able to if they were only part of a stand alone book. When I started out I must admit that I was a bit cocky. I wrote five chapters of my first book and sent it out to seven agents. Pompously, I declared I wasn’t going to write another chapter until I got signed by an agent. Well, I got very lucky and an agent was interested. I wrote the rest of the novel, it was published by Kensington and the rest, as they say, is history. Specifically, regarding my latest series – THE FERRARA FAMILY MYSTERY SERIES – I was discussing book ideas with my editor and he asked if I was interested in writing a cozy mystery. I had never really contemplated it before simply because it wasn’t on my radar. However, once we discussed the genre in more depth I realized a cozy mystery is a continuing saga that just so happens to have a high body count so I was intrigued. 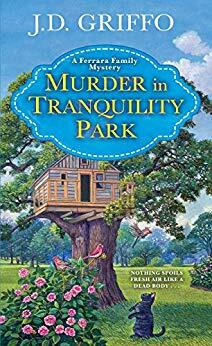 I’m so grateful my editor made the suggestion because otherwise I wouldn’t have created the hilarious, tight-knit Ferrara family, nor would I have written MURDER ON MEMORY LAKE and I wouldn’t have MURDER IN TRANQUILITY PARK set to be published this month. No matter what genre I write in I have the same goal: I want my readers to be emotionally fulfilled when they read the last line of one of my books. If that hasn’t happened I haven’t done my job. It’s very important to me that each reader feels as if the journey was worth their time and energy so I put as much energy and thought as I can into my books. I can spend hours searching for just the right word to express a thought and I’ve spent just as much time tweaking a line of dialogue to make the reader feel as if the conversation is completely real. I also want them to feel as if the time they’ve spent with my characters has been worthwhile. I love Alberta, Jinx, Helen, and Joyce and all the inhabitants that make up Tranquility, New Jersey where THE FERRARA FAMILY MYSTERY SERIES is set and I want the readers to love them just as much. That’s an easy question. The most rewarding thing about writing is knowing that I have taken a mishmash of ideas, an outline of a story, and the embryo of a character and somehow connected all those elements into one cohesive narrative. It really is like giving birth and each time I finish a novel I’m just as proud and amazed as I was the first time I became a literary parent. For me, the most challenging part of writing is when I have to kill off a character that I’m emotionally attached to. It’s true that I love all my characters, whether they’re the hero or the villain, but the truth is that not all characters are created equal. Some serve a sole purpose and their time on the page is known from the beginning to be short. Others were born to drive story and are going to be around for the long haul. And then there are some characters who regardless of the length of time they spend in a book, touch me in a specific and unshakeable way. I had to kill off that kind of character in UNAFRAID, which is the third book of THE ARCHANGEL ACADEMY SERIES and it broke my heart. It was much more traumatic than I thought it would be even though I’m the one who planned on the character’s demise. Other than that it may sound cliché, but staring at a blank computer screen knowing I have to fill it with a string of intelligible words can be the most daunting challenge in the world. It doesn’t matter that I always come equipped with an outline of my novel so I know what I need to accomplish before I sit at my computer, if the muse is preoccupied that day, it’s going to rough going. What advice would give to people wanting to enter the field? You need the 3D’s if you want to be a writer – Desire, Discipline, and Dedication. If you don’t have them you will, in my opinion, fail. Or at best never achieve your full potential. You must have the desire and passion to become a writer above any other career. You must be disciplined to create a game plan and a method as to how you’re going to write on a daily basis and stick to it. And you must be dedicated not only to sticking to your writing calendar, but to do whatever you need to in order to become a better writer. Take classes, attend seminars, listen to feedback, learn how to self-edit. If you can’t do all three, you’re going to have a difficult time becoming a writer. My tastes are wide and varied and I read all kinds of books. I really like Joanne Fluke’s Hannah Swensen cozy mystery series and am working my way through Cara Black’s Aimee LeDuc Mystery Series. Of course I love supernatural and fantasy fiction so I read a lot of Neil Gaimon, Shirley Jackson, and Ursula K. Le Guin. I recently devoured the entire Patricia Nell Warren canon and can’t resist picking up Philippa Gregory’s historical fiction or anything by Agatha Christie and Ellery Queen. My all-time favorite novel is JANE EYRE and I just read a new book that has quickly become a favorite – BEHIND HER EYES by Sarah Pinborough, which I can’t stop thinking about. Drum roll please! I am a Level 5 Adult Figure Skater! I have been obsessed with figure skating for decades. I watch every competition on TV, I’ve gone to see Skate America several times, and can spend hours on Youtube rewatching classic skating routines from the Peggy Fleming and Scott Hamilton eras. Last year while watching the Winter Olympics I decided to finally get off of my couch and embrace my passion for the sport and become a participant – literally and not just figuratively. The next week I was in my first adult skating class. I was the oldest person in the class, but I didn’t care and soon I started to master the basic skills. I’ve been taking lessons since then and currently I’m working on perfecting my backward crossovers and my two-footed spin. Beijing 2022 here I come! What are the best ways to connect with you or find out more about your work? To find out more about my books and special events, visit my website at michaelgriffo.com. 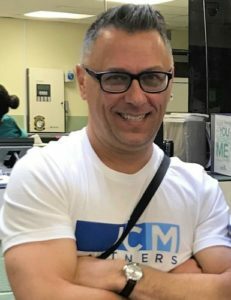 or my Amazon.com author page https://www.amazon.com/Michael-Griffo/e/B004MRYH6K I’m also on Twitter @Michael2264, Facebook at https://www.facebook.com/michael.griffo.33, and Instagram #j.d.griffo. I look forward to hearing from you!